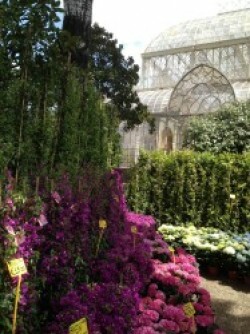 Yesterday I visited the beautiful fair of flowers and plants at the Horticulture Gardens in Florence. This wonderful garden was officially opened in 1859 after three years of construction and immediately it became an experimental garden, erecting a dibble,planting vines and tomatoes and other rare and ornamental plants and flowers. In 1880 the Federazione Orticola Italiana organized the first National Exhibition in Florence and a big tepidarium,the largest one in Italy,was built. Another important point of the Horticulture Garden is the Loggetta Bondi which was built in 1911. Now and especially during these days it is a very quiet place where you can spend a relaxing afternoon and see and appreciate more than 60 best Tuscan flowers and plants growers. It is really an oasis ull of color, scents and flowers: roses, azaleas, rhododendrous and aromatic plants. Opening hours: 8.30 a.m.- 7,30 p.m.